Amwell Rotary Club organises various events throughout the year to raise funds that are then used to support local, national and international good causes. 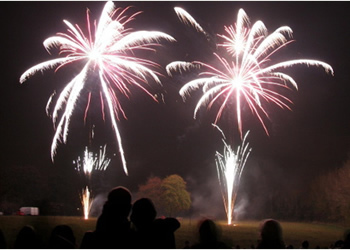 Some of these, such as the Ware Fireworks Display and the Christmas Carol Service at Haileybury are long established favourites that are held each year. Some, such as quiz nights or sponsored cycling challenges are one off events, and others, such as the Ware Dickensian Evening, see us take part in local events to raise awareness of who we are and what we do just as much as to raise funds to support our work in the local community. Follow the links below for more details on some of these. There is also a link to a page giving details on our printer ink cartridges scheme where you can save money on your PC consumables and help our club funds at the same time. We are extremely grateful to everyone who supports our fundraising activities. On behalf of Amwell Rotary Club, a huge Thank You! Now in it's 48th year, this annual event attracts a crowd of around 4,000 to 5,000 people each year who come along to see the giant bonfire being lit before enjoying a spectacular fireworks display. 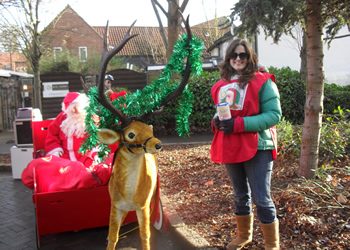 Every year, in the weeks leading up to Christmas, Santa and Rudolph take Santa's sleigh to various locations in Ware, Hoddesdon and Hertford . Santa spends his time checking children's Christmas wish lists and also helps his friends from Amwell Rotary Club as they collect donations in aid of Rotary supported charities and good causes. After taking a break last year, we are delighted to announce that this popular event returned to Ware for 2018. The race took place on Sunday July 8th. If you're booking a holiday with Riviera Travel please mention Amwell Rotary Club! By phone - just call 01283 742300 (their Affinity Scheme number) to make a booking - mentioning/registering Amwell Rotary Club. If you prefer to book online you just need to telephone Riviera Travel the same day, or the following morning, to ensure that your booking is logged and that Amwell Rotary Club is registered to receive their donation.